Now delivering value around the world. Each day, forward-thinking companies are transforming blockchain’s promise into bottom-line business results. And they’re doing it with IBM Blockchain. But building and deploying enterprise blockchain solutions continues to be larger than any one business can tackle on its own. Discover how IBM Blockchain can help you bring together allies across departments and disciplines, industries and organizations, and countries and cultures. See latest news What is blockchain? Learn how Mediaocean is helping advertisers and agencies erase opacity and avoid intermediaries costing billions in online ad fraud and waste. Visionary growers, processors, wholesalers, distributors, retailers and others are enhancing visibility and accountability throughout the food supply with IBM Food Trust™. we.trade brings together fierce banking rivals to create new business value in offering liquidity to small and medium-sized businesses. What’s big at IBM Blockchain today? The IBM Blockchain Platform is now on more clouds and in any geography to meet your business needs, including data sovereignty requirements. Learn how the world’s leading blockchain for business platform bridges differences – different companies, different industries, different ways of working – to solve common goals. That now also extends to different computing environments – from AWS to IBM Cloud to IBM Z. Find out why the IBM Blockchain Platform’s security, control, ease-of-use and multi-cloud flexibility are catalysts for radical change among blockchain disruptors everywhere. With more than 1,500 industry and technical experts, discover why IBM Blockchain Services is the place to start, accelerate and innovate your blockchain network. Bringing together an expansive partner community of innovators, regulators and suppliers, work with the IBM Blockchain Ecosystem to establish, join or run a network. IBM helps you rapidly simplify blockchain complexity to commercialize a network, unlock new value and scale up competitive advantages. What’s the potential ROI of IBM Blockchain? 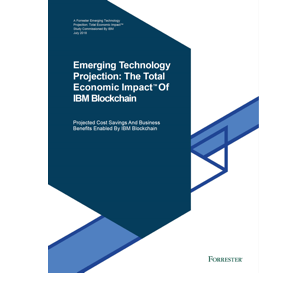 We commissioned a Forrester Total Economic Impact™ (TEI) report to help you identify the cost, benefits, flexibilities and risk factors of working with IBM Blockchain. The research is based on Forrester’s TEI methodology, financial model framework and case studies, plus interviews with IBM Blockchain stakeholders and customers. Register now to watch our latest webinar and read the report to project your cost savings and the business benefits of working with IBM Blockchain. Join thousands of businesses producing new value, re-writing the rules of their industry and changing the way the world works together. ¹ "Blockchain Enterprise Survey: Deployments, Benefits & Attitudes." Juniper Research, July 31, 2017.